Wireless chargers are great at getting power into smartphones without anyone having to plug a cable in. That’s pretty much the only thing they need to do, but that means that even while some of those wireless chargers aren’t the ugliest thing in a room, nobody would accuse them of looking good. That’s a problem that the folks at accessory maker Twelve South set out to fix with the PowerPic, and they might have managed it. 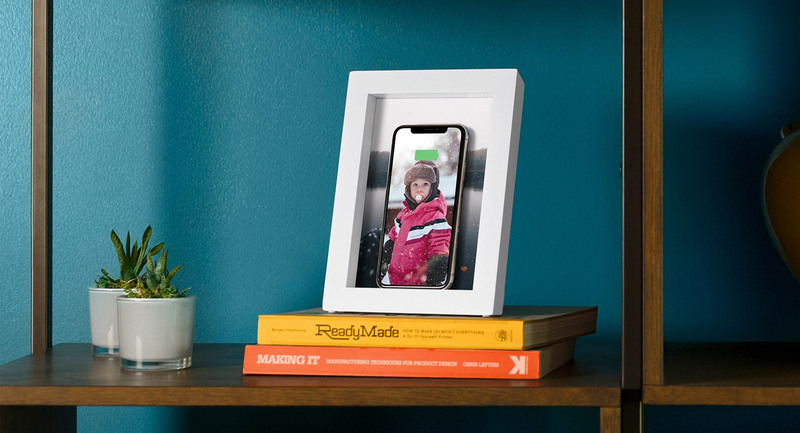 As that name might give away, the PowerPic is a wireless charger masquerading as a photo frame. Made from New Zealand pine, the frame holds any 5″ x 7″ photo but also has a 10W wireless charger built right in. The idea is that you put a photo in the frame and have that sit there when the charger is not in use, looking just like any other modern picture frame. However, when you need to get a little more juice into your smartphone, you slap it on top of the photo and it magically starts charging. Anything up to 1oW is good to go, and cases up to 3mm in thickness are also unlikely to cause any charging issues, according to the manufacturer. Twelve South even offers some photos that it thinks would go well with the frame, as well as some smartphone wallpapers that can be used. That way, when the device is placed on charge and the display lights up, the phone’s wallpaper can be used to “complete” the image. Imagine a photo of Paris that, when a phone is placed on top, gains an Eiffel Tower. The effect is impressive, although it will only work while the phone’s display is lit up. Still, it’s a great idea. The PowerPic is available for order now at twelvesouth.com/product/powerpic and costs $79.99 with free shipping. You’ll have two colors to choose from – black or white – so you should be able to make this thing fit in with your decor without too many problems.